Doom and Bloom SURVIVAL! (2014) is a very good looking game with simple enough rules for those who do not regularly play niche boardgames to learn and enjoy. 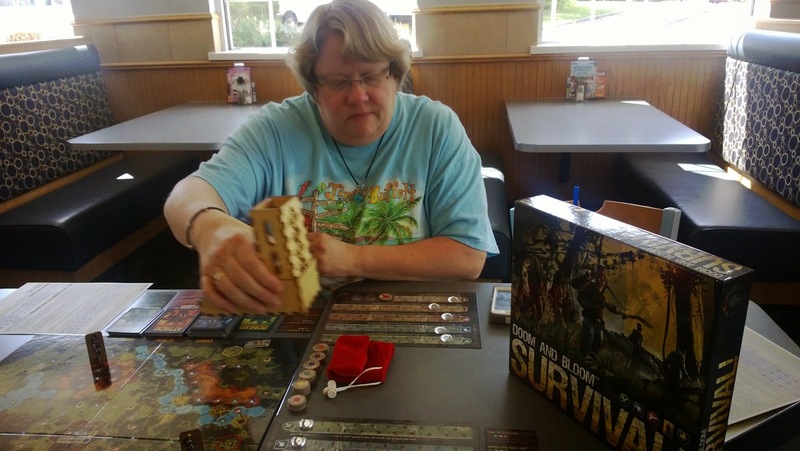 Because the game avoids genre game tropes, like zombies, even its supposed post-pandemic theme is not likely to turn off new players of tabletop hobby games. My friend Wendy picked this up as part of their successful Kickstarter campaign here. They have a website for the game here with the rulebook available to read here. You can check out all of the components there including the cards in each of the three decks (Event, Attack, Bonus). Doom and Bloom SURVIVAL! is a board game for 2-4 players. It takes place in a post-pandemic world where there are few survivors. Your mission is to have your character accumulate supplies like food, fuel, weapons, and medical kits, as well as scout locations that may serve as a haven in which to start over. You start off in once-peaceful center city, now controlled by raiders out to get what you have. There are plenty of resources out there, but you have to get to them and survive various encounters and attacks to reach towns that have potential as safe havens. You’ll have to plan your route to include spots that have the assets you’ll need to stockpile. Some of these spots are controlled by raiders, and you’ll have to survive attacks to gain the items you need. Once you’ve scouted locations, you’ll have to return to center city for your family and more supplies. You then pick a location as your final destination. If you can get there with the required supplies and survivors before anyone else, you win the game. The game dynamic revolves around the management of assets while you are traveling to your destinations. You'll be tempted to use them to gain an edge in an encounter, but you have to stockpile them to be able to win the game. 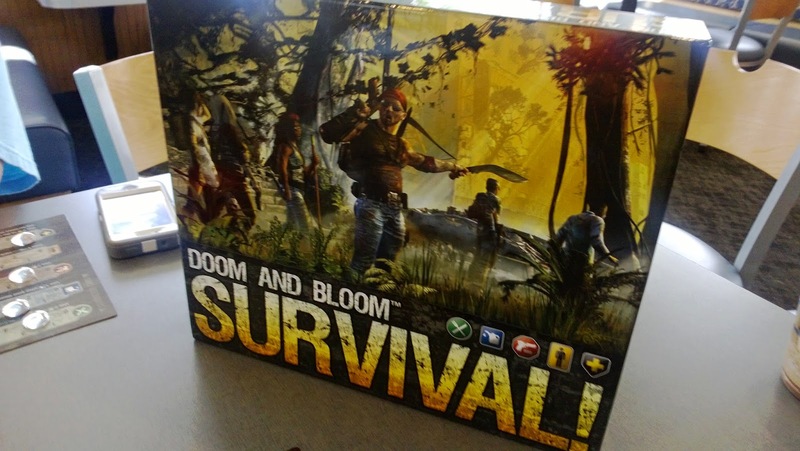 Different gameplay styles and a unique route traveled in each game, coupled with game-changing Bonus cards, make Doom and Bloom SURVIVAL! a fun and challenging game. It is easy to learn but has multiple levels of complexity. Originally tailored to survival enthusiasts that wanted a real survival scenario (no zombies), gametesting has shown us that the game has appeal to all gamers. 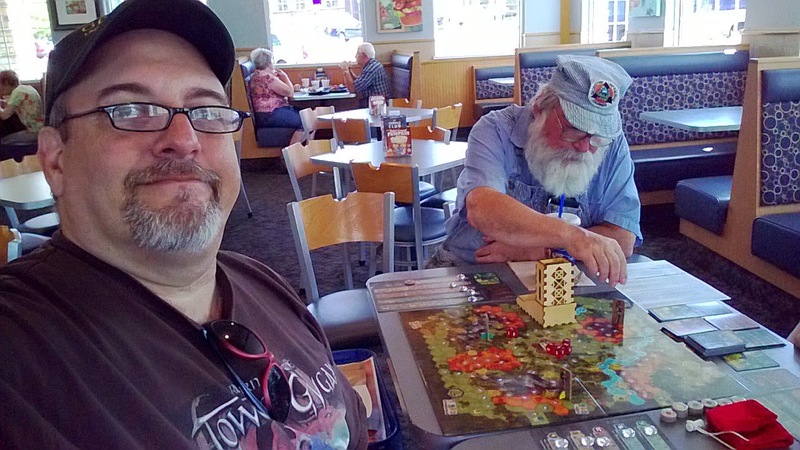 Several of us were on hand to play when she brought the game into our weekly Culver's circle yesterday and we all appreciated the stunning look of the components. This, even without the Kickstarter stretch goal miniatures that are still due to replace the sturdy, cardstock player pieces included with the game. I've heard some rumblings regarding the stands provided with the cardstock player/character pieces, each stand a different color, as if they were not necessary and that may be so but they certainly allow player to keep easy track of their own "leader" character as play progresses. I do agree with the criticism I have seen regarding the leaders having essentially not lasting use beyond having different starting assets (resources [food, fuel, weapons], survivors [basically follows], and Med Kits). If the leaders each had some other purpose during gameplay, if might add to the replayability of the game. 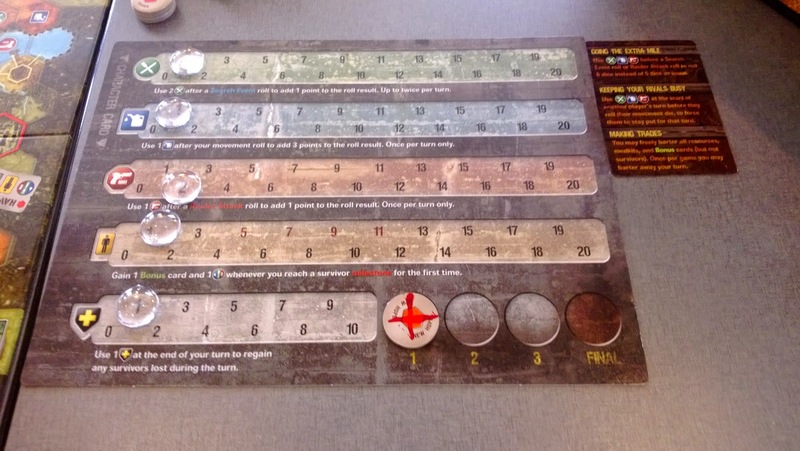 The game board and the player mats are very useful and look quite nice. Using sliding scales on the mats for keeping track of assets was a good choice as opposed to collection, discarding, and exchanging cubes or Meeples, as this happens so regularly during game play that it would have been unwieldy. The mats also have a place for destination goal tokens. The magnifying crystals used to keep track of the assets are a clever touch. It might have been good to have a way to keep track of scouted destination on the mat, as they cannot be returned to for additional resources once visited. So, too, the "hospital" locations. It comes with sic d3s (six-sided dice with two 1s, two 2s and two 3s on them). Most of the time you are asked to roll five of these dice and can sometimes use resources to roll six. You can also use a resources to adjust the numbers on either Events deck rolls or Attack deck rolls. 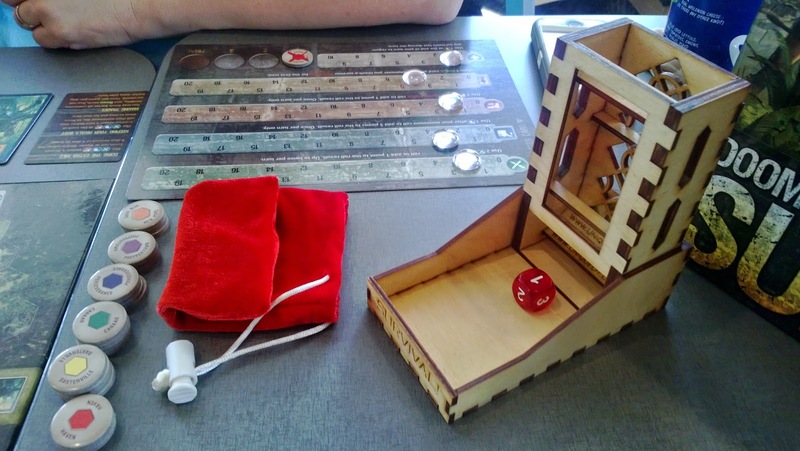 As an add-on, Kickstarter patrons were given the chance to snag a nifty, small dice tower for $25. It comes unassembled but that's not a deterrent to anyone who games these days. It has a window so you can watch the dice tumble through it. The bag that comes with it is another nice feature that comes standard with the game. All in all, I'm on the fence with this one. I like the look and care that went into the components but my initial impression is that there is simply not enough depth to warrant pulling it off the shelf many times. It simply takes much longer than a game of its depth should take. It says on the tin that it's a 30 - 120 minute game but three of us playing through the shortest version available took us over 90 minutes. I will play it again but will restrict that playing to the single destination game, as adding a second or a third destination simply seems like a way to prolong gameplay with just more of the same. Perhaps that should be a clue to me as to where my opinion is already leaning. 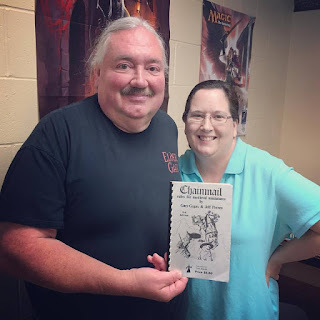 For good measure, and a bit from others who have differing opinions than one another on this game, have a look at what Kae has to say on InitiativeTabletop.com here. Also, check out the video review just below from Board Game Brawl on YouTube. 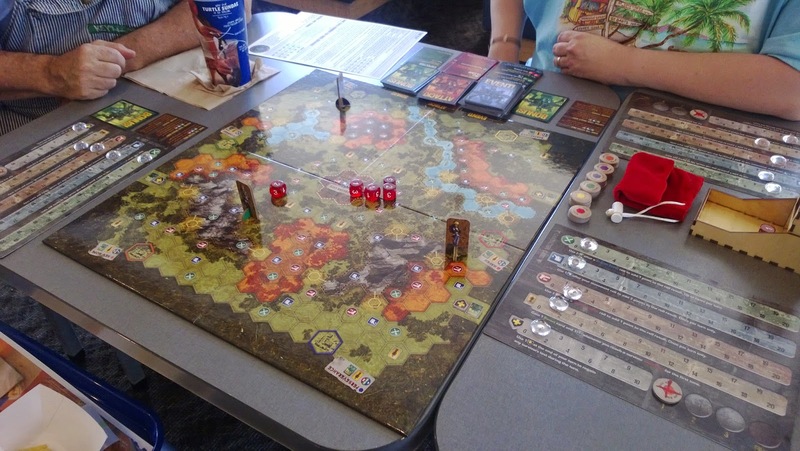 As you can tell, this game taken as an intro game to those not accustomed to the panoply of modern boardgaming allows it to fare much better than if viewed as a game for regular tabletop hobby boardgamers. As a game meant for those used to more options and less happy with games dictated by dice and a handful of powerful cards, it just isn't quite there. I could see that changing with some new cards and dice mechanics which isn't an impossible future for this game since the rest of the components are in place. I'm thinking maybe add some specialty dice where one or two of the six-sided dice have more 3s than 1s and when you add a die it becomes the one with a higher average result. Or include a mechanic where you replace a die or dice with the higher averaging dice. It wouldn't be all that hard to introduce an advanced gameplay deck with new leader cards, some scenarios that include more complex missions, and alternate decks to replace the three (Event, Attack, Bonus) decks currently with the game or add to them (perhaps removing certain cards from the current deck. There's a lot that could be done to add on to this game or advance it, building on the excellent base that has been available thus far. We'll see what comes of it all in the next six months or a year.